The Constitutional Court in the Democratic Republic of the Congo (DRC) has ruled that Felix Tshisekedi won the recent poll. But the runner-up Martin Fayulu has rejected the court's decision. 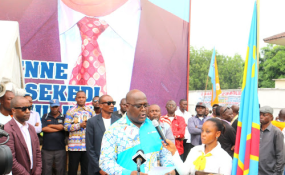 He claims that he has been robbed of victory under a secret deal between Tshisekedi and the outgoing president Joseph Kabila and has declared himself president. No one should be surprised by the court's verdict. It would have been very surprising had the DRC's Constitutional Court overturned the electoral body's decision. The court has a history of supporting the regime. In 2016 it gave former president Joseph Kabila an extension of his mandate under a "caretaker" role, allowing him to stay in power stay beyond his constitutionally mandated term limit. Fayulu doesn't have many options open to him. There aren't many legal channels left open given that the Constitutional Court's decision is final. And while the African Union (AU) has questioned the results of the presidential election, it is unclear what - if anything - it can do to pressure Tshisekedi to cede power. Realising that neither the AU nor SADC may be able to help him, Fayulu has called for a campaign of civil disobedience. But, in reality, some kind of compromise needs to be found between the two protagonists. Fayulu must be offered a top job in the government. In an ideal world, that job would be the presidency. However, that now seems completely unlikely. I can see him being asked to become the leader of the Senate or even the prime minister. Even then, he may well refuse anything but the presidency. That doesn't mean that the offers for something significant in government should not be made. The DRC's political situation is perilous at the moment given that the presidential election is widely seen as lacking legitimacy. There have been reports of protests in some cities and two civilian deaths have been reported in Kikwit. Fayulu has called for peaceful demonstrations and has been careful not to speak about violence. In my opinion, he has been very dignified as he has pursued his claim on the presidency. But his supporters may be less patient if the government doesn't listen to their concerns. Aside from trying to firm up his political legitimacy, he will have to work with the ruling regime, the People's Party for Reconciliation and Democracy - Kabila's party - which won the provincial elections. Getting his own political programme off the ground will be tough. He will have to deal with the continuing violence in Kasai and in northeastern Congo. The violence in eastern DRC is propelled by a large patchwork of different armed groups, each with their own histories. Some, such as the local Mai Mai groups, suggest that they formed to protect their communities from external threats. Others, such as the Democratic Forces for the Liberation of Rwanda and the Lord's Resistance Army, are groups who are exiled from their home countries and are now working in the DRC. Tshisekedi will also have to manage the DRC's economy. Economic growth will rise to 4.5% in 2019, up from 4% in 2018. This increase is more a reflection on the performance of mineral companies and the global demand for their products, than the living standards of the Congolese as a whole. Yet it is a good sign that the government will continue to draw sustainable tax revenue from these companies. In terms of the peace and security of the Congolese people, president elect Tshisekedi will likely take a "big government" approach. When I saw him speak in London in December 2017, he seemed a big fan of state intervention as the answer to violence. But state intervention is problematic in the Congo because of the central government's inability to fully control what is one of the biggest countries in Africa. Local level corruption often subverts central government authority.